Comment: What's the point of the Hyundai Genesis? Brand building is a difficult business, particularly if you’re making your journey from a lowly starting point. In company cars, particularly when there’s an element of driver choice, the image of a brand can make all the difference when it comes to selecting the model you’ll be running for the next three or four years. Just 10 years ago, Hyundai’s cars in the UK were still very much budget cars, chosen by people who weren’t terribly interested in image and tactile qualities of interior materials. Much like a tumble dryer or a vacuum cleaner, a Hyundai did a job of getting people from A to B. There were flagship models in the UK in the past. The XG30 sat above the Sonata in the range at one time. And more recently the Grandeur, sold by one Hyundai dealer, and perhaps the reserve of the president of Hyundai UK and Korean diplomats. Hyundai never really had the image for its large cars to equate with what UK car buyers understood as an executive car. 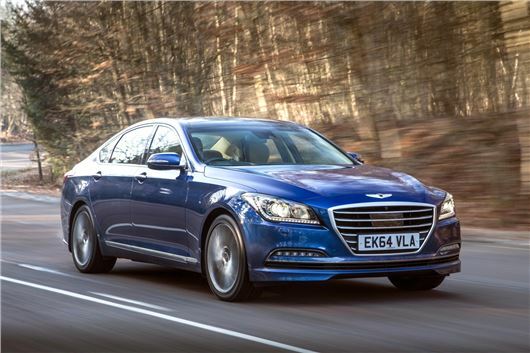 Hyundai recently announced prices and specifications for a new flagship model in the UK: the Genesis. At around five metres long, with rear-wheel drive and using a 315hp 3.8-litre V6 petrol engine, it’s close in size and concept to cars like the Audi A6, BMW 5 Series and Jaguar XF. The car is spacious, with fine-grain leather seats, radar cruise control, autonomous emergency braking, and, according to Hyundai, the world’s first CO2 cabin sensor. This monitors air quality in the cabin and helps reduce the risk of the driver becoming drowsy. Cameras provide a 360º view of the Genesis, giving assistance to the rear cross traffic alert function, which warns drivers of approaching hazards when reversing from a parking space. Blindspot detection improves safety when changing lanes, while a head-up display projects vital information into the driver’s line of sight. While most of these features are not new, you’d pay handsomely for them as options on premium-badge cars. The Genesis is priced at just short of £48,000, which sounds very high. But if someone were to choose a BMW 535i Luxury then add options to match the Genesis’s level of equipment, the price would be £55,000. On that basis, depreciation would be little different between the two, according to residual values forecasters. Few of us in the UK have driven it, but many who haven't were quick to voice their opinion on it, suggesting it would be a disaster. There were many on social media who scoffed, saying how they’d choose a premium executive saloon and keep the change; how the depreciation on the Genesis would be horrendous; how it was just too expensive for a Hyundai. But this is to miss the point. If Hyundai wanted to sell the Genesis in the UK in any great volume it would have launched it with a diesel engine – it has access to a hi-tech four-cylinder diesel that produces around 200hp. But at least people have kept an open mind . . . The Genesis is here in a similar specification to the one that has been a hit in North America. The fact is that hardly anyone in the UK buys petrol six-cylinder 5 Series models. Audi doesn't even offer a petrol V6 apart from the high-performance S6. Hyundai's new flagship will be available from April through a limited number of dealers. It will be too expensive for most car buyers and will only be chosen by those who really like it and can afford one. The purpose of the Genesis is to show what Hyundai is capable of, and what to expect in the next generation of models, one of which might well be your company car. It's getting us used to what a Hyundai will be like in future, in terms of ability, technology and design. Recent Hyundais such as the i30 and i40 have demonstrated they can compete with European and Japanese rivals on ability. The Genesis is a signal that as the brand replaces its line-up over the next few years, it will have cars that present a stronger image, as well as remaiing true to the core strengths that have given them their success to date: being cost-effective and desirable choices. Hyundai will have completed its transition to the mainstream.